Addresses joint stiffness of the elbow by using a low load, prolonged stretch modality. The Pro-Glide Jr. is designed for pediatric and small adult applications. Featuring a single-hinge design and lightweight construction, the orthosis is comfortable and easy to fit. The unit easily converts from an extension splint to a flexion splint with the simple turn of a screw. 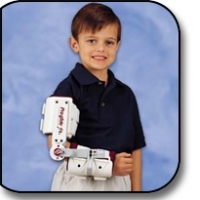 Malleable Wire-Foam� cuffs and length/width adjustments provide a customized fit for the patient. The unit comes with machine washable liners. Weight: 1lb. 10 oz. Softgoods replacement kit available. Specify right or left. Measure bicep circumference, wrist to elbow crease, elbow to axilla. Extend patient\'s arm to end range before measuring. #4127BL - Bicep: 6-1/2\" to 7-3/4\" Wrist to Elbow Crease: 5\" to 7\" Elbow to Axilla: 6-1/4\" to 7-1/2\"
#4127BR - Bicep: 6-1/2\" to 7-3/4\" Wrist to Elbow Crease: 5\" to 7\" Elbow to Axilla: 6-1/4\" to 7-1/2\"
#4127CL - Bicep: 7-1/2\" to 9-1/2\" Wrist to Elbow Crease: 6-1/2\" to 7-1/2\" Elbow to Axilla: 6-1/4\" to 7-1/2\"
#4127CR - Bicep: 7-1/2\" to 9-1/2\" Wrist to Elbow Crease: 6-1/2\" to 7-1/2\" Elbow to Axilla: 6-1/4\" to 7-1/2\"
#4127DL - Bicep: 8-1/2\" to 11\" Wrist to Elbow Crease: 6-1/2\" to 7-1/2\" Elbow to Axilla: 6-1/4\" to 7-1/2\"
#4127DR - Bicep: 8-1/2\" to 11\" Wrist to Elbow Crease: 6-1/2\" to 7-1/2\" Elbow to Axilla: 6-1/4\" to 7-1/2\"